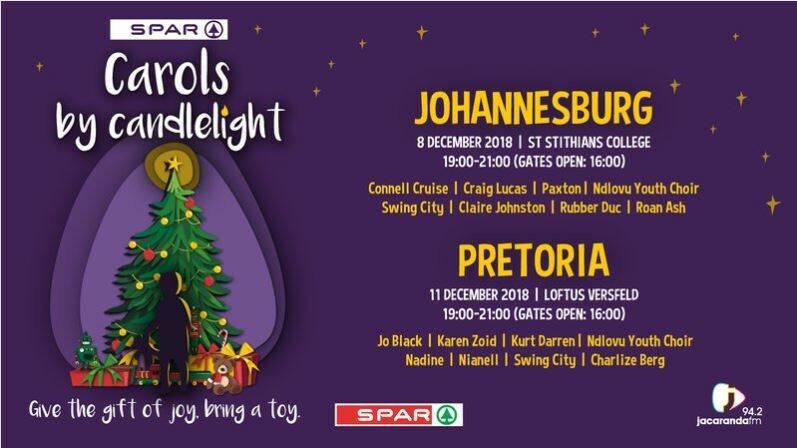 SPAR Carols by Candlelight with Jacaranda FM will be coming to Johannesburg on Saturday, 8 December at St Stithians College and to Pretoria on Tuesday, 11 December at Loftus Versfeld. 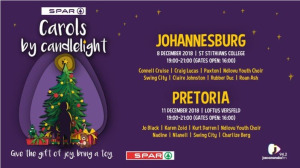 Connell Cruise, Craig Lucas, Paxton, Swing City, Claire Johnston, Rubber Duc, Roan Ash and the Ndlovu Youth Choir will aim to bring in the festive cheer to Johannesburg, while Jo Black, Karen Zoid, Kurt Darren, Charlize Berg, Nadine and Nianell will be joined by Swing City and the Ndlovu Youth Choir in bringing the Christmas spirit to Pretoria. The Jacaranda FM presenters will be broadcasting live from both events. The children's entertainment area, provided by headline sponsors SPAR, will provide entertainment in the form of jumping castles, face painters, games, crafts, buskers, movies and more. Entry is free; however, attendees are encouraged to bring a toy that will be delivered to selected charity organisations. Candles will also be on sale at R30, songbooks at R10 and a songbook and candle bundle package at R35. All proceeds will go to Jacaranda FM Good Morning Angels. Gates at both events will open at 16:00 and the programme will officially kick-off from 19:00 to 21:00.